One of the best blitz chess players in the world, having won the World Blitz Championship and held one of the highest online blitz ratings ever, Alexander Grischuk is also an incredibly strong player at longer games. He has played in many Candidates tournaments, attempting to challenge for the World Championship. Despite having fallen short each time so far, he is currently the third best player in the world and has a very bright future ahead of him, surely challenging for the World Championship within a short time. 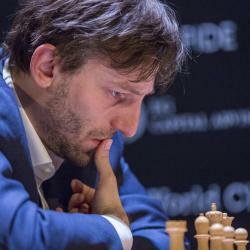 Alexander Grischuk became an International Master in 1998 and a Grandmaster in 2000. He has had many opportunities to qualify for the World Championship but has always fallen short. In 2000, the same year that he became a Grandmaster, he made it to the semi-finals of the FIDE World Championship. In 2004 he reached the quarter-finals of the same tournament before losing to Rustam Kasimdzhanov who went on to win the championship that year. In 2009, Grischuk won the Russian Championship in his home country. In 2012, he reached the finals of the Candidates tournament, losing to Boris Gelfand who went on to play against Viswanathan Anand in the World Championship match that year. Grischuk used his blitz prowess in order to advance through the matches, using a plan of getting each match to be tied heading into the blitz tie-break and winning each of his matches in the tie-break. Unfortunately this strategy didn’t work against Gelfand in the final round. Grischuk is one of the best blitz chess players in the world, having once held the record for highest rating ever on the Internet Chess Club. He won the 2006 World Blitz Championship and came in second in the 2012 version. Nowadays he continues to be among the elite chess players, being ranked as high as third in the world.